Eagle Scout C.J. 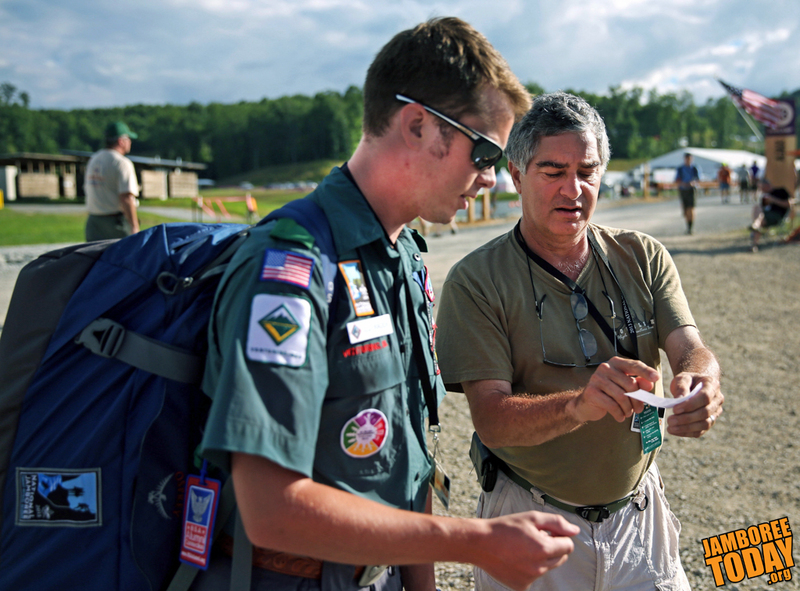 Rauch from Caldwell, N.J,, receives helpful directions from a follow staff member upon his arrival to the Summit Bechtel Reserve on Saturday July 13, 2013. BSA photo by Trey Spivey. Walk on the left. "Be alert on the roads at all times," says Nancy Reed, safety service chief of staff. Participants should always walk on the left side. Although there will be virtually no vehicles on the roads, watch for emergency vehicles and step aside if they approach. Reed reminds campers that at night they should wear reflective clothing or use a flashlight easily visible to any drivers on the roads. Watch your step, not your phone. "Be alert. Minimize texting, talking and walking," says Sven Rundman, a safety service lead officer. The Summit offers beautiful vistas for you to enjoy and also uneven terrain that can trip up inattentive hikers. Read before you go. Before entering a bathhouse, campers should check the signs outside to make sure they're going to the right facility. Men and women have separate facilities, and some facilities are designated for youth or for adults. Under no circumstance should anyone use a facility that is not designated for them. Shower shoes in the shower only. Participants should wear flip-flops or sandals in the showers, but change into closed-toe shoes before walking into camp. Leave the curtain open, please. Prevent awkward situations in bathhouse by leaving the stall curtains open when you leave, so that other campers can easily see which stalls are unoccupied. Check the weather. Campers should use a smartphone, or ask fellow campers, to check the weather forecast throughout the day. It is very important to consider changing weather conditions around the Summit and to always bring proper gear for any situation, says Scott Weaver, the deputy director of the high-adventure safety corps. Close tent flaps if there is a chance of rain. All Scouts and Venturers should carry rain gear in their day packs. Carry your safety essentials. All participants and staff are issued information cards with their identification card, which they should review carefully. One of them lists 10 safety essentials that all campers should carry at all times, including sunscreen, hats, flashlights and jamboree maps. Drink water. One information card provides a water intake guide. At a minimum, all campers should drink at least a quarter-quart of water each hour and more when it's hotter than 85 degrees. Drinkable water is available from high-capacity spigots on the back of all bathhouses. Finally, Scouts, Venturers, leaders and staff members should look out for one another. "Don't let your fellow jamboree participants get hurt because you saw an accident about to happen and did nothing," says Weaver. "The Summit is a big place," he continued. "Be prepared and have your essentials with you."